Year 6 pupils from St Joseph’s Catholic Primary School devised and filmed the short documentary film “Fabric of Our Town”. 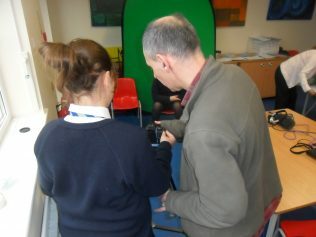 The pupils attended workshops with oral history and filming specialists, facilitated by Digital Works. 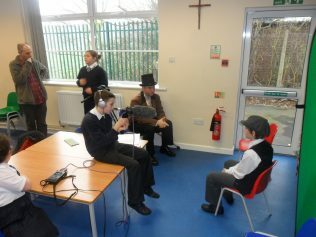 The workshops taught the pupils about the importance of oral history, how to conduct an oral history interview as well as film and sound recording techniques. The children used these skills to interview and film ex-employees of the David Evans factory in Crayford as well as local historian Peter Daniel. Filming also took place of Year 6 pupils from St Joseph’s played the role of the local children who were interviewed by Lord Ashley (later the Earl of Shaftesbury). This short documentary film also includes footage of the creation of the bicentenary banner. The songs that form the background music for the film were performed by the pupils at St Joseph’s.